If the purple haze is consistent then a Photoshop correction could be applied. It will be interesting to see if other lighting schemes will eliminate it. Was the Olympus at full aperture? Was it the latest/most coated one? Thanks, Chris. Yep…the Olympus was at full aperture. Normally, it seems sharpest wide open. But I’ll try stopping down ½- to 1-stop to see what happens. And, it is the multicoated version. I find on my D700 that a sharp edge, with the most bestest of lenses, takes three, or slightly more, pixels on the sensor. That’s precisely my observation, too. Using Live View, I could see 2-3 pixel transitions. Processed, magnified edges in Photoshop show 3-4 pixels with the JML lens. Unfortunately, I didn’t get a chance to check how these images appeared in this post until this morning. I think I set the jpeg compression too low---the transitions aren’t very clear. I’ll try to post some better examples. Also, I realize the high-contrast, back-lit target used here emphasizes pure resolution, not the other-side-of-the-coin, lens contrast (and sharpness of low-contrast edges). Next step, a subject with a mix of edge contrasts. Your fine-grained sandpaper idea sounds like just the ticket. Somewhere I’ve got some plastic-backed polishing paper, in various grades. They’re translucent, so could be illuminated from front or back. The effective aperture would be (7+1) x3.5 = 28, which according to the common references, should be starting to have some effect, with a D700 sensor. You know in my landscape photography, I generally consider anything above f/11 diffraction territory, where the entire image starts getting soft. For landscapes and close-ups to 1:1, I wouldn’t think of going above f/22. It still bothers me to run the calculations at >4x and see such high f-numbers. I want all my macro lenses to be f/1, (7+1)*1 = f/8! Of course, the closest lenses to this ideal are microscope objectives. It would be nice if the low-pass filter could be easily removed! I keep reading the rumors about Nikon and Canon secretly developing modular DSLR’s with interchangeable sensor modules, with various pixel count---few number of large pixels for high ISO photography, large number of small pixels for max resolution. They could offer them sans filter(s) or make it easier to just remove them yourself. Would also be great for IR/UV photography, not to mention ease of cleaning the sensor. Pop out the sensor module and clean off every last spec of dust under the ‘scope! I have a sample currently being held up by the Icelandic Impediment. I’ll be interested in your, and Rik, Pierre’s, results. I’ve found reality checks are always good. The first image shows a large, diffuse blue flare at the center of the image. I meant to point that out. I beleive, as mgoodm3 stated it is due to light reflecting off the lens elements then the highly-specular, partially metalized, resolution slide, then back through the lens. If I tilt the slide the blue area shifts. I thought of tilting the slide for the tests, but the DOF would be problematic. The Olympus also shows this effect, but to lesser degree. Possibly because the front elements are much smaller area. Some of the effect may be coming from sensor reflections. Off the top of my head, I can't think of a way to test which cause is more significant. But I sure it is made more extreme with 100% back-lighting, as is the case here. After thought, maybe tilt-shift the lens on my Nikon PB-4 bellows? I'd love to see some test shots of a "real" subject. That touches on a subject that I happen to be very opinionated about. In ancient times, I used to run some pretty sophisticated computer modeling to optimize process control on thin-film coating processes. I quickly learned the axiom, simplify, simplify and then simplify, again. While I agree that the final goal is to create appealing images of “real” subjects that tend to be three-dimensional, and indeed that will be the final, most valid test of a lens’s performance, I think there are other issues that must be considered. Taking deep stacks of images and processing them into a final image inevitably introduces a huge number of additional variables, which are difficult, if not impossible, to fully control. Focus stacking software like Zerene Stacker and Helicon Focus are getting better with each generation, but are still far from perfect (although ZS is getting close! ). Even capturing a single image introduces the possibility of vibration, induced by the mirror, shutter or other source, which can cloud the results. If the result of capturing and processing a stack of images is excellent, it likely means the lens in very capable---if the result is poor, is it the lens or some other variable? Also, as we all know, it takes lots of time and effort to expose, process and evaluate large image stacks (for testing alone, pure drudgery for me). Since acquiring the D700 about a year ago, my preferred method for testing, as mentioned by Rik in a recent post, is using Live View (despite it’s incredibly poor Nikon implementation, with it’s inexplicable requirement to slam-bam-wham the mirror, at most, 1-sec prior to exposure---but that’s another story). I think the ideal subject for testing and comparing lenses for macro use would be perfectly flat, with feature relief (depth) much smaller than the DOF of the lens being tested so that the entire width and depth of the field could be imaged (capture or Live View) at once, without adjusting focus. It should exhibit a range of textures, including sharp edges of varying contrast. The fine-grain sandpaper mentioned by ChrisR might be perfect, if it can be held flat enough. If not, a bug placed between two precision optical flats and run over with a steam roller so its z-axis was a few microns thick, might work nicely! Since you mention the sandpaper, I'll admit to trying the 3000 grit wet/dry silicon carbide stuff. It's dark and boring, and needs a 60x objective to pick out the grains. There are plenty of specular highlights to cause a veiling haze. I mounted a piece in a 35mm slide mount. Over the half mm or so field width, the depth was about 30 microns. I used 1 micron steps and processed it to find that I needed much finer steps. Another day perhaps. Maybe try 400 grit, at 7x, instead! My copy of the lens arrived today. On quick look, it appears to be admirably free of false color. But for sharpness, it comes nowhere close to my Olympus 20 mm f/2 bellows macro lens. Here are actual pixels from the corner of a frame that is 3.04 mm wide at the subject. On a 22.3 mm sensor (Canon T1i = 500D), that is 7.34X. These are single frames, critically focused using Live View, and the subject field includes sufficient depth to assure that focus was not missed. For $10, it's a great lens. I don't think I'll be spending any more time on it, though. Thanks for the reality check, Rik. I bow to the greater wisdom. Sorry folks, for the false alarm. But at least those who purchased them didn’t break the bank. Still it might be good if the others take a few minutes to test their copies for possible sample variation, especially on sensors with larger pixels/larger format that may be more forgiving. I don't think this is a matter of "greater wisdom", it's just different data. The moth scales are a test subject that I care about and that I'm used to working with. I also tested on a piece of silicon carbide sandpaper, illuminated with pretty small light sources. As ChrisR says, there are plenty of specular highlights. But what I noticed with those was not veiling haze, but false colors. The OM lens gave shockingly higher false colors throughout the image, including at image center. Here is an example. These are a couple of early test frames from before I got the exposures and magnifications matched, but I think you can see the issue. On the left is the JML, on the right is the OM. This is image center, by the way. 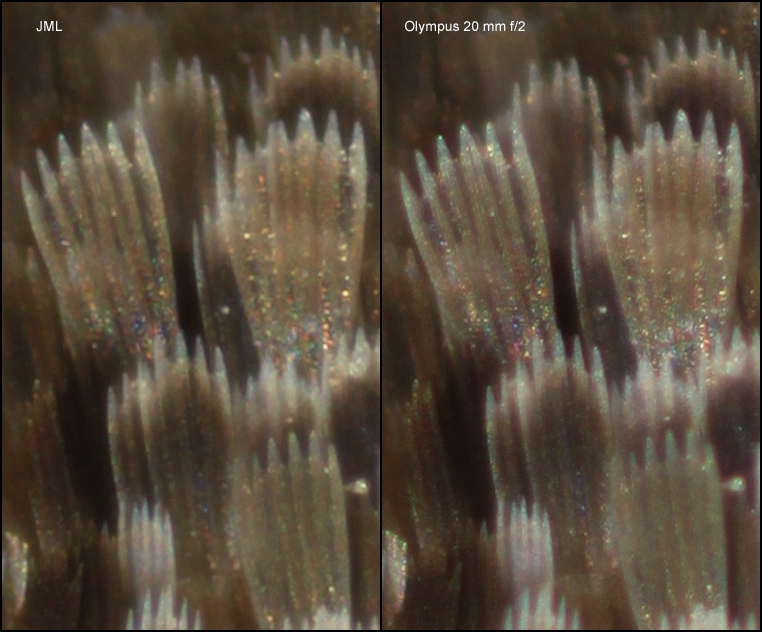 Notice that the red and cyan fringes on the grains are not consistently placed with respect to the highlights. On some grains they are red below, others red above, some red to the right, some red to the left. It's the same story at image corner -- lots of color fringes, but not consistently placed. This is not conventional TCA. Meanwhile the JML lens is just sitting there cool and neutral as a gray card. This is weird stuff. What's going on? I have no idea. Obviously there is some interaction between the lighting, the silicon carbide grains, and the lens design that causes unpleasant color fringes with the OM. I don't know what that is. Maybe it has to do with how things behave when they go slightly out of focus. In any case, the message is clear: when I want to shoot silicon carbide sandpaper, I should haul out the JML despite its lesser resolution. On the other hand, whatever those interactions are, they don't seem to apply to the moth wing. So when I want to shoot a moth wing, I'll be reaching for the OM. It's a good question what other subjects would behave like the sandpaper. Perhaps some highly textured but shiny cuticle? Don't know. Something to keep in the back of my head as I shoot more stuff in the future. This is an interesting problem -- not just from the standpoint of how these particular lenses behave, but how one might go about designing appropriate lens tests in the first place. I confess, I started the day with grave doubts about the concept of a universally appropriate test subject/protocol. This particular experience has done nothing to make me any less skeptical. Edit: correct typos, "JLM" vs "JML"
Lol. So, it’s not a microfiche reader lens…it’s a specialized sandpaper-analysis lens?! Just gotta love it. And, your observations have made me realize that your skepticism regarding a universal test subject is probably quite warranted. Lol. So, it’s not a microfiche reader lens…it’s a specialized sandpaper-analysis lens?! Silicon carbide sandpaper is an aggregation of small shiny crystals. This lens might be just the ticket for use in mineralogy, which is of great interest to some of our membership. Rik, just before I feel asleep last night, a number of questions popped into my head concerning the differences between our observations regarding the JML lens. From a purely scientific standpoint, when observations differ, I think it’s important to understand why. Are they entirely due to the different equipment used to perform the tests? Or, are they related to variations in experimental methods. From a personal standpoint, if there are flaws in my methods, I am driven to find and correct them---that’s how I learn best. I’m also a bit concerned that any novice members of the forum, who may have purchased this lens, may see the statements regarding low resolution on the T1i and dismiss it---without ever giving looking at its properties on their unique equipment, for their particular applications. Both sets of observations would tend to confirm the good, low artifact, color reproduction properties of the lens. Where they differ most, I think, is in resolution and apparent sharpness. So, I’d like to look at some key differences in the hardware and subjects to see if they might offer an explanation. The above sensor data is from the DPReview web site. Please correct any errors. Obviously, there are other significant differences between the two setups, incl lighting, etc. ; but I’m most interested in these, for the moment. Regarding the difference in NA between the two lenses used for comparison to the JML lens, f/3.5 vs. f/2, how significant is this in terms of diffraction? At 7.5x mag on the D700, EF = (1+7.5)*3.5 = f/29.75 vs on the Canon at 7.34x, EF = f/16.6, how significant is this? Does it fully explain the perceived difference in apparent sharpness on the Canon 4.7µm pitch sensor? How would the JML lens compare to the Olympus 20mm f/3.5 on the Canon T1i? Regarding the test subjects, resolution targets are widely used in scientific fields and lens manufacturing to determine and compare the high-contrast resolving power of lenses. Do they have any value in comparing lenses for use in photomacrography of natural subjects, or are the results irrelevant? 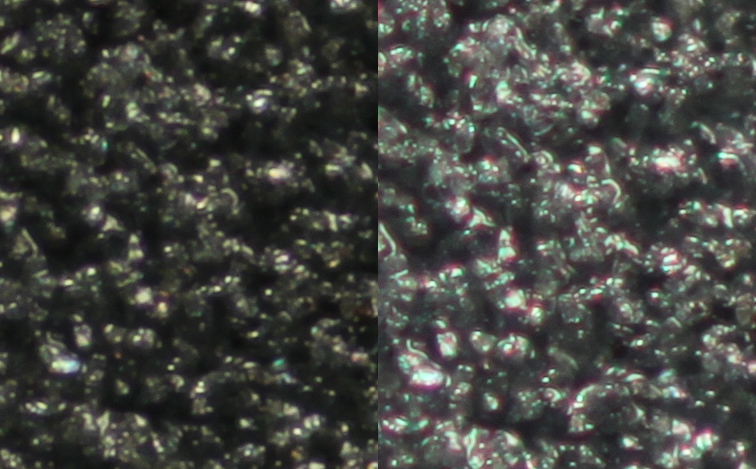 Regarding the two sensors used, how significant is the difference in pixel pitch, 8.45µm D700) vs 4.7µm (T1i)? Assuming that the two JML copies are optically identical, is it possible that the JML lens could provide near sensor-limited resolution to the D700, even though the results are poor on the T1i? It is clear that smaller dimension sensors, with finer pixel pitch are a good match for high-NA microscope objectives. However, are they an equally good match for true macro lenses which were designed and optimized to cover a 43mm image circle? How much difference in resolving power/apparent sharpness would be seen, on the D700, between the Olympus 20mm f/3.5 and the 20mm f/2? Is it enough to justify the high price (for making large prints, 13x19in or larger)? Assuming my copy of the of the $400, Olympus 20/3.5, is good and the JML lens out-performs it for color rendering and resolution on 8µm+ PP, full-frame sensors, perhaps it’s a good low-cost alternative to the Olympus 20mm f/3.5 or f2? I haven’t attempted to run all the calculations to quantify the effects of the variables stated above. And frankly, although I have a background in applied mathematics, I’m still struggling to get my head around many of the mathematical relationships in this specialized field. I really need to construct a tabbed spreadsheet containing all of the pertinent equations, so I can run what-if experiments. Are these questions valid or am I missing something? Slightly teasing, which one was it that was "nowhere close" as sharp as the other? OK, I'll bite. The lower image seems to have more edge definition, but this may be partially due to the clearly higher contrast. There does appear to be more pattern detail in the lower image. I really hope these crops are at something greater tahn 100%, or both lenses should be placed in the garbage bin! What Chris has done is to make a 200% blowup of the out-of-focus scale just to the right and below the labels in my illustration. 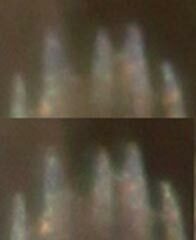 The upper is JML, the lower is OM, neither one reflects best behavior of the lens. JML seems on the top while OM on the middle. Or maybe it is my screen ? For the contrast difference, your analyse suggest the NA # is the possible explanation, then, the lightning must be adapted for each lens regarding the angle sensibility ? I have a Xti (400D), but no OM 20, sorry, i am afraid not being in position to perform the same test as Rik and You. Anyway, the Rik's test confirm this is a good lens for me. Europe faces some transport problems yet.